Purpose The aim of this study was to compare between sublingual immunotherapy (SLIT) and subcutaneous immunotherapy (SCIT) in the treatment of pollen-induced vernal keratoconjunctivitis (VKC) in children.Patients and methods This was a prospective randomized case series. Forty-six patients with grass pollen-induced VKC were enrolled in this study. The cases were divided randomly into two groups: group A included 23 children treated by SLIT and group B included 23 children treated by SCIT. All cases were assessed for improvement by measurement of the level of specific immunoglobulin E (IgE)/6 months and by clinical scoring system/3 months. This system comprises the total subjective symptom scores (TSSS) and the total ocular sign score (TOSS). Data were collected, compared, and analyzed.Results Both routes, SLIT and SCIT, led to a statistically significant effect (P˂0.001) in the improvement of these cases of pollen-induced VKC, and this was evident from all of the follow-up variables including specific IgE test, TSSS, and TOSS. There was no statistically significant difference between the two routes of administration of immunotherapy in the specific IgE test, TSSS, and TOSS at all the follow-up visits (P<0.05).Conclusion SLIT had the same efficacy as SCIT in the treatment of children with grass pollen-induced VKC, but with less pain and a shorter and a more convenient schedule compared with that of SCIT. Purpose The purpose of this study was to evaluate the relationship between smoking and dry eye in the adult population.Patients and methods A total of 500 male patients, 250 smokers and 250 nonsmokers, were recruited for this study in the period between May 2015 and April 2016. In addition to history taking and general examination, all participants were asked about eye irritation symptoms and were subjected to slit lamp and fundus examination. Schirmer 2 test, using topical anesthesia, tear break-up time (TBUT), and rose bengal staining were done for all study participants.Results There was no statistically significant difference between the age of patients in both groups. The mean age of smokers was 41.44±7.55 years, whereas in nonsmokers it was 39.97±7.59 years. Schirmer 2 test values were significantly lower in smokers compared with nonsmokers (P=0.017). In smokers, the mean value of Schirmer 2 test was 13.91±6.81 mm, whereas in nonsmokers it was 16.58±7.41 mm. TBUT values of the smokers were significantly lower in smokers than in nonsmokers (P=0.035). It averaged 11.9±5.8 s in smokers and 14.9±5.5 s in nonsmokers. The rose bengal staining scores did not differ between the two groups (P=0.467). Additionally, a linear negative correlation was detected between smoking index of smokers and their Schirmer 2 test and TBUT values. The eye irritation indices of the smokers were statistically higher than those of the nonsmokers (P=0.0007).Conclusion The findings of this study suggest that smoking affects the tear film secretion and stability. In addition, it causes eye irritation symptoms, and so smokers are more likely to have dry eyes and severity of dry eye is more in smokers than in nonsmokers. Purpose The aim of this study was to present argon laser procedure as a treatment option for symptomatic inferior conjunctivochalasis (CCh) refractory to medical therapy and to evaluate its efficacy.Patients and methods A prospective interventional study was conducted to evaluate the clinical results after argon laser photocoagulation for symptomatic inferior CCh using a slit-lamp-mounted argon laser under topical anesthesia. Twenty eyes with CCh refractory to medical treatment were enrolled in the study.Results The symptoms significantly improved in all patients, and the conjunctival laxity disappeared in eight (40%) of 20 eyes and improved in the remaining 12 (60%) eyes after the treatment of CCh with argon laser.ConclusionArgon laser photocoagulation of the conjunctiva can successfully treat CCh with symptomatic attenuation. Purpose The purpose of this study was to evaluate the prevalence of keratoconus among candidates of refractive surgery in Upper Egypt.Setting The study was conducted in Sohag University Hospital and Future Center (a private center) for laser in-situ keratomiluesis and refractive surgery in Sohag Governorate, Egypt.Design This is an observational cross-sectional study.Patients and methods Refractive surgery candidates referred for preoperative evaluation before laser in-situ keratomiluesis, photorefractive keratectomy, and phakic intraocular lens implantation in the period from April 2015 to September 2015 were screened for keratoconus using Sirrus Scheimpflug camera.Results The study included 1202 patients, 623 male and 579 female. Keratoconus was detected in 210 (17.5%) patients.Conclusion Prevalence of keratoconus among refractive surgery candidates in Upper Egypt is relatively high, which may reflect an underlying high prevalence in the general population. Purpose The aim of this study was to evaluate the role of ultrasound biomicroscopy (UBM) in diagnosis, decision of intervention, and follow-up monitoring of secondary iris cysts.Patients and methods This case series study included 17 patients diagnosed clinically of having secondary iris cysts. History and full ophthalmological examination included visual acuity testing and slit lamp examination. UBM and B-scan ultrasound were performed for all cases. The study cases were divided into two groups according to the management plan (surgical management group and follow-up group). The follow-up period was 1 year.Results The study included 17 cases with unilateral secondary iris cysts. They were five females and 12 males, with age range from 3.0 to 44 years and a mean of 9.01±10.76 years. The clinical presentations such as blurring of vision, uveitis, red eye, ocular pain, or disfiguring intraocular swelling were insignificantly related to the different management groups (P>0.05). Angle closure and corneal touch (detected by UBM) were significantly present in the surgically managed cases, with P values of 0.003 and 0.009, respectively. The cyst size dimensions and its relation to the visual axis were detected with an insignificant difference between both groups.Conclusion UBM had a great value in the diagnosis of secondary iris cysts. Certain UBM findings were very important in deciding the different management plans and follow-up monitoring. Purpose The aim of this work was to study the performance of the implanted one-piece versus three-piece intraocular lenses (IOLs) in relation to the dimension of the capsular bag of the highly myopic eyes.Study design This was a retrospective comparative case–control study.Patients and methods One-piece IOL was implanted in 25 eyes of 13 patients (group A), and three-piece IOL was implanted in 25 eyes of 17 patients (group B). Ultrasound biomicroscopy was performed postoperatively. The main outcome measures included anterior chamber depth, angle opening distance, trabecular–iris angle, diameter of the capsular bag, diameter of the implanted IOL, and white-to-white distance. All patients included in this study had highly myopic eyes with axial length greater than 26.5 mm. All eyes were planned for clear lens extraction or cataract extraction.Results The mean follow-up period was 3.81±1.82 months. In group A, a statistically significant negative correlation was found between the diameter of the capsular bag and the diameter of the implanted one-piece IOL (r=−0.56). In group B, a statistically significant positive correlation was found between the diameter of the capsular bag and the diameter of the implanted three-piece IOLs (r=0.88). There was a statistically significant correlation regarding anterior chamber depth, angle opening distance, and trabecular–iris angle (P=0.02, 0.03, and 0.04, respectively).Conclusion Ultrasound biomicroscopy showed that there was a difference regarding the positioning of the IOL in highly myopic eyes. The statistical analyses, in both groups, point to a statistically significant correlation between the diameter of the capsular bag and the diameter of the implanted IOL. Purpose This study aimed at the evaluation of the role of oxidative stress markers such as superoxide dismutase (SOD), malondialdehyde (MDA), and catalase activity in senile cataract and primary open-angle glaucoma (POAG) to allow for modification and updating the management of such cases.Patients and methods This is an observational case–control study. The study included 60 participants divided into three equal groups: group A (20 normal persons) as the control group, group B (20 patients with untreated POAG; newly diagnosed), and group C (20 patients with senile cataract). Serum oxidative stress markers were measured in all groups and statistical analysis of data was performed.Results In comparison with the control group, serum SOD increased significantly in group B patients with POAG (2.11±0.3 U/ml, P<0.001) and insignificantly in group C patients with senile cataract (1.01±0.18 U/ml, P>0.05). In addition, serum MDA increased significantly in group B patients with POAG (4.12±0.81 nmol/ml, P<0.001), whereas no significant changes were noticed in group C patients with senile cataract (2.74±0.64 nmol/ml, P>0.05). Serum catalase activity decreased significantly in group B patients with POAG (16.24±3.25 U/ml, P<0.001), with no significant changes in group C patients with senile cataract (21.77±4.17 U/ml, P>0.05).Conclusion Oxidative stress markers had a significant role in the pathogenesis of POAG and had no role in senile cataract. MDA increased significantly in cases of POAG, and antioxidant activity (except SOD) decreased in such cases and were not changed in cases of senile cataract, indicating the importance of the addition of antioxidative therapy in conjunction with the medical treatment of POAG. Purpose The aim of this study was to evaluate the effect of visual display terminals (VDTs) use among primary school children.Patients and methods A school-based prospective observational cross-sectional comparative study was carried out on two groups of primary school children in Egypt, in the period between January and April 2016. History of using VDTs in different patterns was documented together with the associated different eye complaints, whether visual or nonvisual. External eye examination, red reflex, visual acuity, and noncycloplegic refraction were performed.Results The current study included 1075 children in grades 3–6 of primary schools. Their age ranged from 9 to 13 years. The usage of different types of VDTs in private school children was highly significant than in governmental ones (P=0.00001). The computer vision syndrome was significantly higher in private school students (P=0.01). However, the detected visual errors had a nonsignificant association with children using VDTs (P=0.25).Conclusion There was a high significant association between certain patterns of VDTs usage in primary school children and certain ocular complaints such as headache and eye fatigue. Visual errors could be measured easily in children, with nonsignificant association with VDTs users. Aim The aim of this study was to determine the pattern and risk factors associated with elevated intraocular pressure (IOP) in patients attending a specialized uveitis clinic during a 6-month duration.Materials and methods A cross-sectional observational study was carried out in a specialized uveitis clinic, in Kasr Al-Aini Hospital, Cairo University. Patients with acute or chronic uveitis were included in the study. Patients with transient postoperative uveitis, masquerade syndrome, or presenting with glaucoma before the onset of uveitis were excluded. A comprehensive history was taken and all patients were subjected to full ophthalmological examination. Patients were considered to have ocular hypertension if the IOP was 21 mmHg or more without evidence of glaucomatous optic neuropathy or visual field changes, while those with evidence of glaucomatous optic neuropathy or visual field changes were considered to have secondary glaucoma.Results Eighty-four patients with a mean age of 30.76±12.77 years were included. The IOP was elevated in 35 (44 eyes) patients. Among 44 eyes, seven (15.9%) eyes developed glaucoma and 37 (84.1%) eyes were having ocular hypertension. Elevated IOP was significantly associated with closure of the anterior chamber angle (P<0.001), activity of the disease (P<0.001), and route of steroid intake (P<0.001).Conclusion Closure of anterior chamber angle, activity of inflammation, and route of steroid intake are considered as risk factors for the development of elevated IOP in uveitic patients. At-risk eyes should be monitored more frequently to avoid development of secondary glaucoma which represents a challenge. Purpose The objective of this study was to evaluate choroidal thickness (CT) in patients with diabetic retinopathy (DR) and normal individuals.Patients and methods Totally, 60 eyes of patients with diabetes and 25 eyes of normal individuals underwent computed tomography scanning using enhanced-depth imaging spectral-domain optical coherence tomography. Patients with diabetes were classified into four groups: mild, moderate, severe nonproliferative diabetic retinopathy, and proliferative diabetic retinopathy. Manual measurement of CT was carried out at the foveal center and at a distance of 500 µm and 1500 µm in both directions from the fovea. Measurement was taken from the outer limit of the retinal pigment epithelium line to the end of the choroidal image on the optical coherence tomography (choroid–sclera junction).Results The mean subfoveal CT decreased significantly with progression of diabetic retinopathy and diabetic macular edema. However, CT in the control group showed the highest measurements. There was no statistically significant difference in age between the two groups (P>0.05). It was noted that the mean CT was thinnest nasally, followed by thickening subfoveally and thinning again temporally in normal individuals and patients with diabetes.Conclusion CT is altered in diabetes and may be related to the severity of retinopathy. The presence of diabetic macular edema is associated with a significant decrease in CT.
Purpose The aim of this study was to evaluate the efficacy and safety of early versus late use of bevacizumab (Avastin) as an intravitreal injection in cases with branch retinal vein occlusion (BRVO).Patients and methods Twenty patients with BRVO with macular edema were divided according to the time elapsed between presentation and the onset of the vascular event into two groups: group I included 10 patients presenting within 3 months of BRVO and group II included 10 patients with BRVO presenting after 3 months of the vascular event. Patients in both groups received three intravitreal injections of bevacizumab. The first injection was administered at presentation, and then monthly for two additional doses.Results Foveal thickness measured by optical coherence tomography in µm decreased significantly after the intravitreal bevacizumab injection in group I from 451.5±57.9 to 428.1±59.5 after 1 month, to 369.5±52.6 after 3 months, and to 342.4±41.1 after 6 months, whereas in group II, the foveal thickness was reduced from 440.3±75.5 to 437.3±70.3 after 1 month, to 419.1±63.1 after 3 months, and to 380.1+69.4 after 6 months, a statistically insignificant difference. Best-corrected visual acuity in log MAR at baseline in group I was 0.84+0.2 and improved to 0.74+0.19 at 1 month, 0.74+0.25 at 3 months, and 0.72+0.15 after 6 months, whereas in group II, BCVA in log Mar at baseline was 0.75+0.2 and improved after 1 month of intravitreal bevacizumab injection to 0.74±0.26, to 0.74±0.27 after 3 months, and to 0.70±0.27 after 6 months.Conclusion The study showed improved visual acuity following treatment of BRVO-associated macular edema with bevacizumab intravitreal injections. The benefit was greater in the patients who received the first injection early in the course of the disease and in patients in whom three injections were administered. Purpose The aim of this study was to evaluate the effect of early Densiron removal regarding the anatomical and visual outcome, as well as the occurrence of Densiron-related complications.Design A prospective interventional noncomparative case series study was done at the Ophthalmology Unit, Zagazig University Hospital.Patients and methods Fifteen Densiron-filled eyes (15 patients) were included in this study. All patients had previous pars plana vitrectomy with Densiron oil injection for treatment of retinal detachment (RD) owing to inferior breaks with or without associated proliferative vitreoretinopathy. Densiron removal was done after 2–2.5 months from the time of the initial surgery. Active suction by the vitrectomy machine was used for Densiron removal under direct illumination and visualization by using long 18-G silicone cannula. Postoperative follow-up was done at first day; first, second, and third week; and first, second, third, and fourth month after Densiron oil removal. Retinal attachment, visual acuity (VA), and various complications were recorded.Results Two eyes had RD before Densiron removal. Another eye developed RD after Densiron removal. Therefore, 12 of 13 eyes remained attached after Densiron removal (92%). The final mean best-corrected VA improved from 1.39±0.59 minimal angle of resolution (logMAR) before Densiron removal to 1.114±0.55 logMAR at the fourth month after Densiron removal; this improvement in VA was statistically significant (P=0.0046). 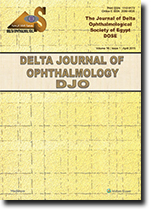 The most frequent recorded complications were cataract which occurred in six of 13 (46%) phakic eyes and emulsification in three of 15 (20%) eyes.Conclusion Regarding anatomical and visual outcomes, it could be safe to remove Densiron-68 after 8–10 weeks from the initial surgery, which consequently decreases the chances of Densiron complications. Purpose The aim of this study was to evaluate and compare the effect of anterior temporal transposition of the inferior oblique (IO) muscle in the management of dissociated vertical deviation (DVD) whether associated with or without inferior oblique muscle overaction (IOOA).Patients and methods This study was carried out on 34 eyes (20 patients) with DVD of at least 10 prism diopters (Δ) in the involved eye. The patients were divided into two groups. Group I included 17 eyes of 11 patients having DVD with IOOA, and group II included 17 eyes of nine patients having DVD without IOOA. The IO muscle was approached through the conjunctiva and Tenon’s capsule by an inferior-temporal fornix incision. The size of preoperative and postoperative DVD, grade of the preoperative and postoperative IOOA, repeat surgeries, and complications were recorded and evaluated.Results The average correction of DVD in group I was 8.13 Δ (preoperative 16.53 Δ and postoperative 8.5 Δ, P<0.001) and 9.47 Δ in group II (preoperative 17.67 Δ and postoperative 8.2 Δ, P<0.001). The mean IOOA was corrected from +2.0±0.5 to +0.18±0.4 in group I (P<0.001). The mean follow-up period was 9.2±2.2 months in group I and 9.3±3.1 months in group II.Conclusion Anteriorization of the IO muscle was effective in correcting DVD with or without IOOA. Preoperative DVD equal to or less than 15 Δ had favorable outcome, but DVD more than 15 Δ had less favorable outcome. Purpose The purpose of this study was to evaluate the effectiveness of intraoperative mitomycin C (MMC) with canaliculodacryocystorhinostomy (DCR) and bicanalicular silicone intubation for the management of adult lacrimal sac mucocele.Patients and methods In a 3-year period, 30 eyes of 28 adult patients with acquired lacrimal sac mucocele were enrolled in the study after thorough evaluation and if required computed tomography imaging was taken. All patients had at least 8 mm of patent proximal canaliculi. Under general anesthesia, all patients underwent canaliculo-DCR with bicanalicular silicone intubation and intraoperative MMC 0.2 mg/ml solution applied for 5 min to the lacrimal passages. All patients were followed up for at least 12 months postoperatively.Results The mean age of the patients was 48.90±12.28 years and 78.6% of the cases were women. After a follow-up period of an average of 16 months, 93.3% of the patients reported successful results (disappearance of epiphora and lacrimal sac swelling and patent lacrimal passages) and only 6.7% presented with recurrent epiphora and obstructed lacrimal passages. No case of recurrent lacrimal sac mucocele was reported.Conclusions Canaliculo-DCR with bicanalicular silicone intubation and intraoperative MMC yielded satisfactory results in 93.3% of adult patients with acquired lacrimal sac mucocele. This case represents an isolated cavernous hemangioma of the optic disc diagnosed by various diagnostic modalities. A 32-year-old woman with no ocular or systemic history was diagnosed with cavernous hemangioma of the optic disc. Fundus examination revealed a cluster of grape-like lesion occupying the lower part of the optic disc and the adjacent peripapillary retina. Fundus fluorescein angiography showed delayed filling of the lesion with late intravascular plasma–erythrocyte separation ‘characteristic fluorescein capping’ with no leakage. Optical coherence tomography revealed dilated saccular clusters occupying the lower optic disc and adjacent retina. Optical coherence tomography angiography showed a hyperintense lesion (denoting vascular flow) involving the lower half of the disc. No associated systemic hemangiomas were found. After a 1-year follow-up period, no changes have been documented.